In another time, the performance of the UKCS over the last year would be a cause for celebration. As reported in today's Oil & Gas UK 2016 Activity Survey (click here), oil and gas production from the North Sea increased by 9.7% in 2015 from 2014 levels, representing the first production increase seen since the turn of the century. This has been achieved on the back of investing £100bn (£60bn capex, £40bn opex) in the basin over the last five years, which has also delivered an increase in production efficiency (annual production/production potential) from 60% in 2012 to over 70% in 2015 and seen operating costs reduced from $29.30/bbl in 2014 to an estimated $17/bbl in 2016. All this has been impressive but in the current $30/bbl oil price environment, over 40% of existing UKCS fields are operating at a loss. If these fields were to be shut down, they would not only represent a loss of production for the basin, but also a significant reduction in the availability of the export infrastructure relied upon by many more fields.With the loss making fields likely to be older, fixed structures, we expect that their closure would result in the removal of a disproportionately large part of existing infrastructure. With expenditure peaking at £14.8bn in 2014, it is unlikely that the hard won improvements over the last few years can be sustained. Less than £10bn is expected to be invested in 2016, with the majority of this going to existing sanctioned developments and less than £1bn expected to be directed to new development. Meanwhile, exploration activity has been dropping in the basin since before the oil price began declining and points to a future lack of projects to fill the pipeline. The industry has made substantial progress in reducing costs and improving efficiency and will need to work collaboratively to continue to do so. The report believes this will not be sufficient to secure the future of the basin however and has called on the government to provide a lifeline through permanent lower tax rates combined with improvements in the Investment Allowance. We question if these measures will be sufficient to stimulate investment and would look for wider commercial and fiscal incentives focused on exploration/ development such as has been successful in Norway to help boost activity. Despite current low oil prices driving dividends being paid out of debt, BP did not cut its dividend yesterday. The BP board and management must therefore strongly believe that the current oil prices are temporarily low. What do other majors believe? We can look at how much Shell paid for Petromanas's Albanian assets for a clue as to its assumptions. Our analysis indicates that Shell's purchase makes sense on long term oil prices of around $45-50/bbl. It is no surprise to see Shell pick up the asset from Petromanas - PMI is a distressed seller while Shell knows the assets very well and took the unusual step of highlighting the exploration in its 2014 markets presentation. Petromanas sold its interest in the Albanian assets to Shell for US$45m. We utilise our 2014 modelling (when we last covered Petromanas as a research client) and assume 25% cuts in the capex to account for recent cost deflation. We leave first production in 2021 and estimated volumes from Shpirag (232mmboe) and Molisht (142mmboe) unchanged. We use a 10% discount rate and assume that there is still risk around developments of both fields, with CoS at Shpirag set at 35% and Molisht at 25%. We accept that CoS is to some degree subjective and that under Shell's sole ownership the CoS is likely higher, but we believe that any uplift in value should accrue to Shell and not the (distressed) seller. This licence has not been the easiest to drill and uncertainties over development remain. The purchase price of $45m implies a long-term oil price of $49/bbl. If we set risking at 50% for both, this would fall to $44/bbl. As a result, it seems possible that Shell is assuming a long term oil price of around $45-50/bbl (2016 real) to justify this deal. In reality, of course, this is only a single data point and could be heavily skewed in favour of the buyer given PMI’s weak balance sheet, or not properly take account of larger resources than we model. However, it does show that even with a potentially imbalanced deal such as this, when purchasing desirable assets buyers are willing to spend well above the value implied by the current futures strip for crude. 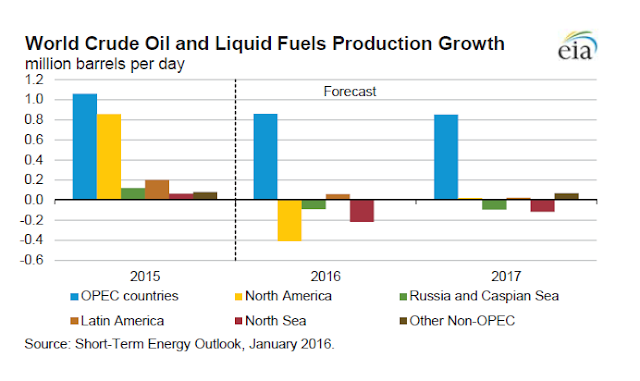 Edison published its latest oil and gas macro outlook on 27 January 2016. Below are highlights of the short term thoughts. The oil markets have been in turmoil now for 16 months, with recent trading at its most tumultuous in years as crude prices have plummeted to levels not seen since mid-2004. A Saudi-led OPEC market-share protectionist policy has driven a marked increase in inventories over 2015, with lifting of Iranian sanctions and potentially slowing Chinese demand set to extend the supply overhang. 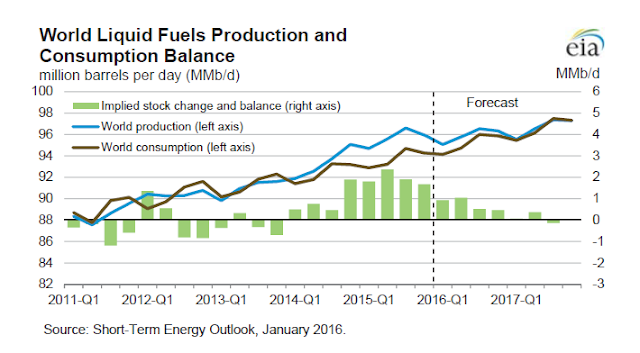 The US Energy Information Administration (EIA) in its recent Short-Term Energy Outlook (STEO) forecasts that, having run at an average of 1.9mmb/d during 2015, this inventory build is likely to continue with an additional 0.7mmb/d supply overhang in 2016. Based on this analysis we are not likely to see a reversal of this trend for at least another 12 months, with stock reduction only envisaged from mid-2017 onwards. 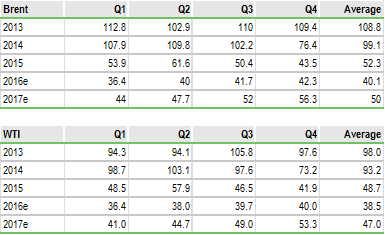 This is despite non-OPEC countries reigning in investment that the EIA expects to result in a marked decrease in non-OPEC production in 2016 (c 0.6mmb/d) and relatively flat global demand growth of c 1.4mmb/d. 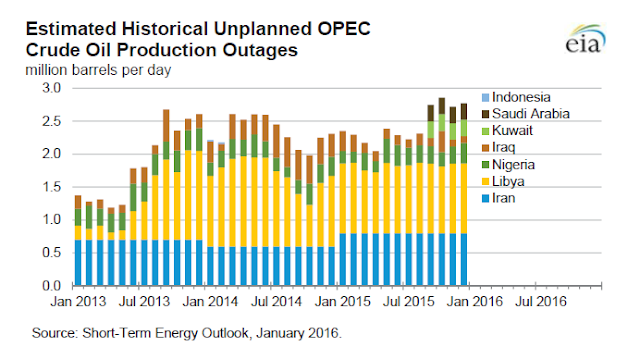 The reason for a growing inventory overhang, and depressed prices, is of course due to continued production from OPEC. Including non-crude liquids, this grew 0.9mmb/d in 2015 to 38.3mmb/d, with the EIA forecasting an increase of 0.9mmb/d in 2016 and 0.9mmb/d in 2017. Libya and Iran form the majority of this potential additional supply. The EIA is estimating that with recent international sanctions being lifted on Iran, this could immediately add a further c 0.7mmb/d onto the global market. We caveat this, however, given some reports that some of this capacity could already be being exported through neighbouring countries, while there are conflicting reports of the capacity and time that it will take Iran to increase production after years of sanctions. The short-term oversupply outlook is clearly going to continue to add downside pressure to oil prices over 2016 and 2017. While we recognise that there are sensitivities to the views presented here (predominantly using EIA data), we do not claim to have more insight than the global agencies and hence for prudence we propose to align our near-term (2016/17) forecasts with those of the agencies. The EIA published its Short-Term Energy Outlook on 12 January 2016 and hence we use these data for our current assumptions. These forecasts for Brent and WTI are shown below. As a sense-check to EIA forecasts, we have also considered the consensus numbers from research published on Bloomberg. Based on forecasts updated since end 2015 (to take into consideration recent market turbulence), we see that EIA forecasts are broadly aligned with Bloomberg consensus. We have aligned our assumptions with EIA forecasts as the complexity and current volatility of the oil markets does not support independent analysis. However, we recognise there are compelling reasons for both bulls and bears to argue for different assumptions. 'Lower for longer': Some analysts (including Goldman Sachs, Morgan Stanley and RBS) called a $20/bbl bottom in December 2015 after a recent OPEC meeting did not agree any production cuts. This is based on break-even cash costs for highly levered US shale producers before production has to be shut-in. We would not fully support this view with many high-cost producers in the US likely to have higher break-even prices than this, although the sentiment has logic. The US service industry in particular has been very responsive, driving down costs to keep many marginal fields still economic at lower oil prices. 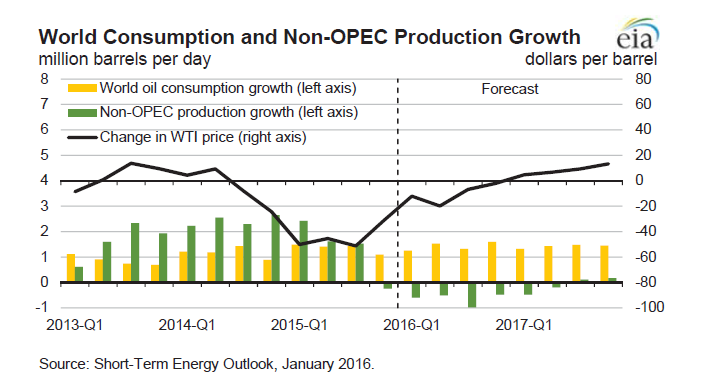 As well as exacerbating the supply glut and keeping prices depressed, the service cost deflation that we have seen during 2015 and into 2016 both provides a window of opportunity for oil companies looking to improve project economics and could potentially have a long-lasting impact on the global supply cost curve. We consider the impact of this on long-term oil prices later in this report. Finally, it is worth noting that Standard Chartered has even pushed short-term oil price forecasts to as low as $10/bbl, although it states that this is based on financial flows caused by fluctuations in other asset prices rather than oil market fundamentals. Structural bounce: On the flip side of the above argument, many believe that geopolitical forces simply cannot support sustained low prices. Many OPEC and MENA oil-producing countries require substantially higher oil prices to balance national budgets (Exhibit 8 shows this analysis, albeit with data from March 2015 and will not consider the global cost deflation seen during 2015). We could therefore expect there to either be structural cooperation to combat low prices across the wider market (OPEC and non-OPEC) or risk increased political instability. OPEC may also be changing its stance with reports that even this week it has made an appeal to non-OPEC nations (primarily Russia) to work together on supply cuts that would boost prices. However, whether such a wider collaboration agreement is possible is still questionable with many countries both within OPEC and outside probably not in a position to sustain the impact of production cuts on a long-term basis.